If you’re serious about the Scriptures and serious about prayer, you will find yourself in a war with God at times. Prayer is a battle. 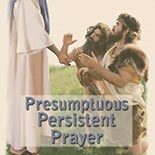 We need to be presumptuous, persistent and even belligerent in our prayers; however our allegiance, loyalty, and affection for Jesus will never waver, regardless of the outcome, because we love Him. Channel any frustration into the heart of God with total trust.